This beautiful pink and ivory embroidered mesh dress has a bohemian look that reminds us of 1970s hippie style. The Flower Child Embroidered Bell Sleeve Pink and Ivory Dress is made of a semi-sheer mesh fabric with ivory embroidered designs throughout. 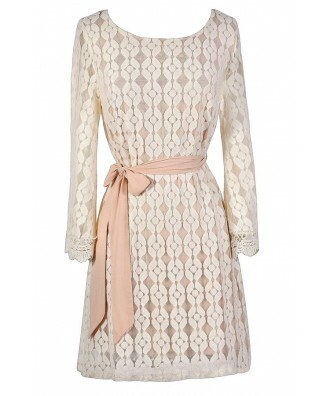 This dress is lined in pale pink fabric, except at the sleeves, which are semi-sheer. It has a rounded neckline and bell sleeves with crochet trim on them. A pale pink fabric sash wraps around the waist and ties this look together. A hidden side zipper completes this dress. The Flower Child Embroidered Bell Sleeve Pink and Ivory Dress would make a cute rehearsal dinner dress or bridal shower dress. This would also be a lovely bohemian festival dress to wear to an outdoor concert. Try pairing this dress with flat beaded sandals and an oversized bag for a chic summer look. Details: Lined except at sleeves, which are semi-sheer. Hidden side zipper. 60% cotton, 40% nylon. Contrast: 100% rayon. Lining: 100% rayon. Hand wash cold water. Do not bleach. Line dry. Iron low. Do not dry clean. Small measurements: Length from top of shoulder to hemline: 33". Bust: 33". You have added Flower Child Embroidered Bell Sleeve Pink and Ivory Dress into Wishlist. You have added Flower Child Embroidered Bell Sleeve Pink and Ivory Dress for Stock Notification. You have set Flower Child Embroidered Bell Sleeve Pink and Ivory Dress as a loved product. You have removed Flower Child Embroidered Bell Sleeve Pink and Ivory Dress as a loved product.